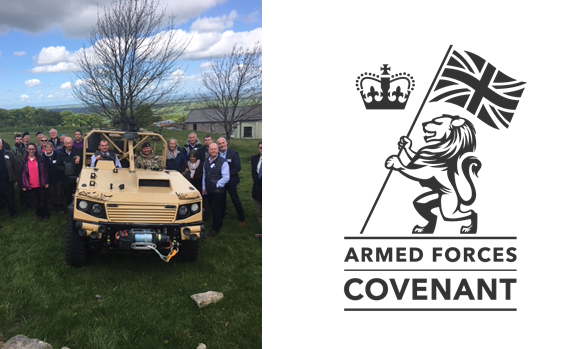 UK military vehicle developer, Supacat and parent SC Group, have re-signed the Armed Forces Covenant, affirming their pledge to uphold the Covenant. This is a promise by the nation, enshrined in UK law, to those who serve or who have served in the armed forces, and their families, that they are treated with fairness and respect in the communities, economy and society they serve with their lives. Head of Supacat, Phil Applegarth, who himself served in the regular Army and continues as a Reservist, re-signed the Covenant on behalf of the company with the Commander South West Brigade, Col Andrew Dawes, during this year’s Ten Tors Challenge on Dartmoor organised by the Brigade. Supacat has supported numerous activities on behalf of the armed forces, including the Ten Tors, where it fielded three of its high performance all- terrain vehicles, Jackal, LRV400 and SPV400. Supacat is aiming later this year for a Silver Award, which enables the UK Ministry of Defence to publicly thank and honour those organisations that have provided exceptional support to the armed forces community and defence by going above and beyond their covenant pledges. Phil commented, “We are very proud to uphold the Armed Forces Covenant and of the many former service personnel and reservists who work for the company and continue to serve their country. The whole company’s culture is one of total commitment to providing our armed forces with the finest vehicles and equipment”. Over 1,500 organisations have signed the Covenant to date, including businesses and charities and all 407 local authorities in mainland Great Britain and four councils in Northern Ireland.